Situated around 2 kms away from the city centre of Chamonix, Lake Gaillands is a small but beautiful lake at the foot of Mont Blanc. 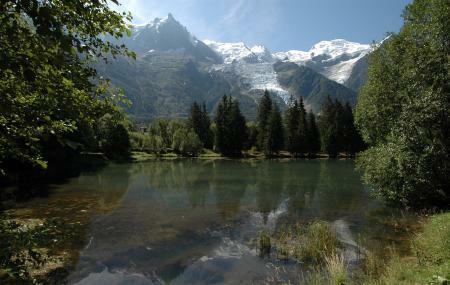 Surrounded by lush green forest, this is an ideal place to picnic while in Chamonix. There are also a few adventure activities around the lake, like rock climbing and zip lining. Entering the lake is not advised. Vehicle parking charges may apply. Train stop at the lake. Bus stop on Route des Gaillands. 5 minutes drive by car. Other snack centres available around the lake. Love this? Explore the entire list of places to visit in Chamonix before you plan your trip. Fancy a good night's sleep after a tiring day? Check out where to stay in Chamonix and book an accommodation of your choice. How popular is Lake Gaillands? People normally club together Gorges De La Diosaz and Vallee Blanche while planning their visit to Lake Gaillands. People also prefer to start their day with Lake Gaillands. Nice to relax near the lake. I saw someone fishing too. So clear water and has great views to mont. Blanc. Lac vraiment simpas pour pêcher la truite. Endroit très tranquille.